I'm picking up the blog again, after taking quite a long time off. To my surprise, folk have been reading our past posts, so thank you very much indeed for that. One of the reasons that I started this blog was to try and deal with some peculiar misunderstandings about how beer and ale are made. In the archaeological and anthropological literature you can read all sorts of odd things about brewing beer in prehistory and how it was invented. Malt is rarely mentioned. I have read that "... beer was invented when some barley got wet in a bucket and then it fermented" or, and I read this very recently, that "... beer is one of the most important of human inventions, as it is likely to be one of the key reasons that farming was started, in order to grow hops for brewing ..."
You need malt, not hops, to provide the fermentable sugars to make beer and ale. This blog is about what happens to the malt in the mash tun - the transformation from grain starch into sugars. Most people don't have the opportunity to see or to experience this magical process. We are fortunate, we have our own mash tun in the garage and we regularly make some very tasty ale and beer, using crushed malt that we buy directly from the maltster. We can go online and buy the malt. It's delivered to the door. We buy 25 kg at a time and it's always very fresh and good malt. Our mash tun can take about sixteen or seventeen pounds of malt and we usually make about ten or eleven gallons of beer. That lasts us a while, so we don't have to make it too often. We can choose how strong or weak we want the beer to be. We do this by deciding how much malt to use and how much water to sparge with. We can add hops or herbs, whatever we decide to do. In the past we've made some very good ancient ales in our mash tun - meadowsweet is the usual herb of choice because we live on Orkney and it grows profusely here. So we can go and pick it in July/August, dry it, store it and use it whenever we want to. We'd like to try other herbs. I'm just starting to grow a brewers herb garden, so far I have yarrow, heather, meadowsweet and angelica. Mostly we use hops. What happens in the mash tun? Saccharification. The creation of sweetness that can be fermented. Grain starch is converted into malt sugar in the mash tun by enzymes in the malt. Where do the enzymes come from? Basically, when any grain begins to germinate, starch converting enzymes are activated in the aleurone layer of cells, just beneath the grain husk. These enzymes convert the starch of the endosperm into sugars, the food source for the growing plant. The maltster's job is to begin germination, then stop it and dry it, very gently, at just the right moment. The craft of the maltster goes back to the dawn of grain agriculture. The first alchemy. Saccharification is an essential part of the brewing process. 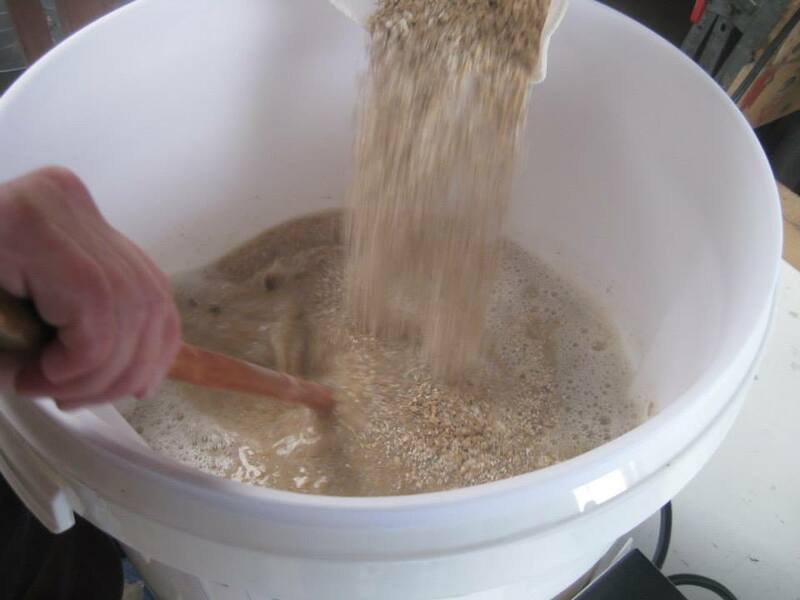 The brewer takes the lightly crushed malted grain and adds it to hot, but not boiling, water in the mash tun. Enzymes in the partially germinated grain re-activate in the mash tun and convert the grain starch into malt sugar. The process takes about an hour. The aroma of a mash is distinctive - it's a strong, sweet, delicious smell. Recently we went to a meeting about recreating old beer styles at Fuller's Brewery in Chiswick, London. As we approached the brewery, even though we could not see it, we knew we were going in the right direction because we could smell the first mash of the day. Exactly the same smell that we get from our little mash tun in the garage. The process is the same, no matter what the size or the shape of the mash tun. A few years ago, I went to the Eindhoven Open Air Archaeology Museum and used an earthenware bowl to demonstrate the saccharification - how to gently heat crushed malt and water over the hot ashes of a fire and make sugars. In the photograph below, you can see the white crushed malt in the bowls by the hearth. For me, that's a little over crushed, but it still worked just fine for the saccharification. In little over one hour, the starchy crushed malt had become a mash of delicious malt sugars, as you can see in the large earthenware bowl in the hearth. Saccharification in a hearth at Eindhoven Open Air Museum. The beautiful bowl was made by Flor Buchuk Gill, she was the potter at the Open Air Museum at the time. The equipment is very simple. The technique is not complicated. There is no need to understand the complex biochemistry that goes on in the mash tun. All you have to do is get the details right and you will get a result. Heat some crushed malt with abundant water at temperatures not exceeding 67 degrees Centigrade and the enzymes will re-activate. If the temperature is too high, then the enzymes are destroyed. The next stage is to separate the sweet liquid (the wort) from the mash. This is done by sparging, washing hot water through the mash and collecting the wort. I shall save that for the next blog. Some people think that the beer brewer's mash tun is something like the wine maker's tub. They are not at all the same thing. They are completely different processes. Perhaps the word 'mash' is confusing. Making wine, as most people know, involves treading or mashing grapes into a pulp, then syphoning off the juice and fermenting it. When making ale or beer, you have to make the sugars first, and this happens in the mash tun. Some people make 'country wines'. Among the most popular are dandelion, parsnip, nettle and elderflower. Each wine making event involves gathering the ingredients and then buying a few kilos of sugar. Dandelion flowers, for example, are mixed with hot water and a kilo or two of sugar. Here's a typical country wine recipe. There are loads of recipes for these so called country wines. They are all pretty much the same. They all involve several bags of sugar. As has been explained in an earlier blog, flowers, nettles or parsnips do not provide any fermentable sugars, just flavour. I can understand why some people might be confused if they have never seen inside a mash tun or if they have not made an ale or a beer using malted grain. For most people today, seeing what happens inside a mash tun is not part of their everyday life and experience. However, a few hundred years ago, making the malt and brewing ale and beer at home was a common activity. It happened on farms and in large households. It was a household task. In the past, when making the malt and the ale was a regular event, it would have been something that people were familiar with. Today it seems to be a mystery to many.